Join the discussion on our forums! 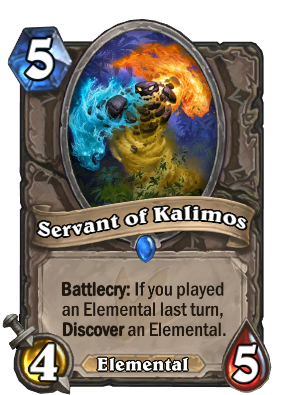 Come discuss Servant of Kalimos over in our dedicated Servant of Kalimos discussion topic. This needs an update, since there have been a couple cards re-classified as elementals. Though thank you for putting this together. It's a big help. Personally found this one the hardest elemental to reliably activate. Then added the 4 mana phoenix, which with one Harbinger discount is very useful. My servants are useful so much more of the time. Is it just me or do all of the talking elementals kinda sound the same? I feel like a large majority is done by the same voice actor. I love this card because he gives Al'akir some play. Oh boy, i just got +2 Kalimos from these guys...i used 8 times, 5 Kalimos :'D maybe bug? I now let you discover 3 different flavors of ragers! Water Elemental is very strong, Lightspawn demands some attention if played. I would be surprised if there wasn't a decent 4 drop added to the mix as a neutral too. I can see an elemental deck where Tol'vir Stoneshaper gets pushed out so that you can activate this battlecry on 5. The reason why this card is very good is because it can Discover an Elemental and it is an Elemental. This means that you can play this without the effect and potentially get something out of it a later turn. Other cards like Tol'vir Stoneshaper are not Elementals and are very bad if played without the effect triggering because it can't trigger the effect of the next card you play next turn that requires an Elemental to be played last turn. 3 kalimos? pssh. 3 lightlords! Just pouring my sadness into meaningless comments. no one will be salty about this card existence, am I right?